Why you can’t find Palestine when you search Google Maps. If you search for Palestine on Google Maps, you won’t find it. Palestine, the name most continuously used for the territory lying between the Jordan River and the Mediterranean Sea from the fifth century BCE, is labelled Israel. Protestors in the Middle East, and on social media, have demanded that Google relabel the region of Israel as “Palestine”, a name Google says has never been used on their mapping service. 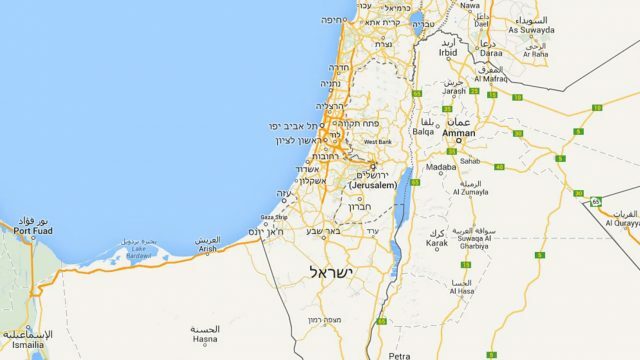 In late 2016, there was outrage when Google Maps deleted the names “West Bank” and “Gaza Strip” leaving only dotted lines indicating borders still undefined. Google restored the labels, but without any reference to Palestine in these Israeli-occupied areas. So why isn’t Palestine on the map? And how does mapping shape people’s understanding of the world? Under the search heading “Palestine”, you can rotate a 360-degree photograph to see the country. The ground, covered in limestone rocks, spreads across the open landscape to distant mountains with clusters of trees in between. There are no buildings. It looks uninhabited. The awful truth is that Palestine has been forced to make the terrible transition into non-existence by Israel’s existence. According to Wikipedia, “Palestine is a de jure sovereign state in the Middle East” – a term selected by the United Nations in 2013 – “claiming the West Bank and Gaza Strip with Jerusalem as the designated capital”. The State of Palestine is recognised by 138 of the 193-member UN General Assembly but not by the US and much of the west. I want to make it very clear that I’m not blaming the Jewish people for taking Palestinian land and lives. Any condemnation of Israel means Zionist-led Israel. This is not an antisemitic article designed to demonise Jews. It’s a criticism of government policy. I have many Jewish and Israeli friends around the world and understand their well-founded fear of extermination. I’m on the side of human rights. I object to governments, individuals and corporations involved in the removal of people from their land and way of life, and anyone who thinks they have power over others and uses military force to prove it. No matter their religion, history, colour or culture. It all comes down to: are their actions fair and reasonable or not? The UN called on Israel to withdraw but instead, the Israelis built heavily armed settlements. Palestinians have been protesting their dispossession ever since. It should be no surprise that Palestine has been left off maps. You’ve probably seen the series of maps showing the radical shrinking of Palestinian land over the last 70 years. But let’s go back 100 years to understand the dramatic chain of events that led to the establishment of a Jewish state and the wiping off of Palestine and its people. In 1917, the Balfour Declaration pledged British support of a “national home for the Jewish people” in Palestine. At the time, Palestine was part of the Ottoman Empire, home to 680,000 Palestinians who owned 97% of the land, and 56,000 Jews, mostly Oriental Jews (a mix of descendants of those driven from Judea by the Romans 1,900 years ago, Berber converts, and Jews expelled from Spain – who’d lived among Moslem peoples in the Middle East for centuries) and those in the first major Zionist settlement, established in Palestine in the late 1800s. At the end of World War I, the imperialist powers carved up the Ottoman Empire. Britain was given Palestine to govern as a colony, under a League of Nations mandate from 1920 to 1948. Oil was a valued economic and military commodity and Britain had investments in the region. Over the next decade, the mass immigration of 100,000 Jews into Palestine triggered the Arab Revolt of 1936-1939 against the British and Zionist settler-colonialists. Britain crushed the uprising in 1939. During World War II, the British, along with the US, tried to pacify the Egyptians and oil-rich Saudis, by severely restricting the entry of European Jews into Palestine as they tried to escape Nazi persecution. The whole empire needed oil from British protectorates. At the end of the war, 250,000 Jewish refugees in displaced persons camps in Europe had nowhere to go. Despite international pressure, Britain refused to lift the ban on immigration and allow 100,000 Jews into Palestine. The Holocaust had a major effect on the region. Jewish militant forces had resisted attacking the British while they were fighting Nazi Germany, but united to drive the British out, using terrorism, then looked to Britain to help establish their national home. In 1947, the newly formed US-backed United Nations accepted the idea to partition Palestine into a zone for Jews (giving Israel 54% of the land) and a zone for Arabs (Palestine). The British withdrew from the region in May 1948, the US replaced Britain as leading imperialist power in the Middle East, and the Zionist leadership announced the Israeli Declaration of Independence. Palestinians refused to accept the UN partition and Israel launched a civil war against them (1947–1948). By the war’s end in January 1949, Zionist militias expelled two-thirds of the population – nearly 800,000 Palestinians. Israel seized 77% of the land. In 1967, Israel launched the Six Day War in response to a Palestinian revolutionary upsurge and seized the remaining 23% of historic Palestine – the West Bank, Gaza and East Jerusalem – along with Egypt’s Sinai Peninsula and Syria’s Golan Heights. The UN called on Israel to withdraw from the occupied areas but instead, the Israelis built heavily armed settlements. Since then, Palestinians in the West Bank and Gaza have been under harsh military occupation, denied basic rights and prevented from developing a viable economy. Palestinians have been protesting their dispossession ever since. In the 2000s, Israel erected a concrete apartheid wall, razor wire, electrified fences and sensors, trenches and watchtowers across more than 650 kilometres of Palestinian land in the West Bank, isolating towns, separating farmers from their fields, and annexing more land for Israelis. The US and EU cut off or restricted aid to the Palestinian Authority, plunging Palestinians in the West Bank and Gaza into dire poverty. The blockade of essential goods and services, including power, water, electricity and fuel for nearly two million civilians in Gaza, was done in the hope of a regime change. More than a decade on, looking down at the Gaza Strip on Google Maps you can see the open-air prison, home to an impoverished population, 80% of whom are refugees, 70% unemployed. It’s small, treeless, packed with war-ravaged buildings, under siege. Palestinian refugees also number in the millions in the West Bank, Jordan and Lebanon. For Palestinians, there are many problems to navigate with Google Maps. In January 2018, a report by 7amleh – a Palestinian organisation advocating online rights – analysed Google’s mapping and labelling, noting numerous ways Google is complicit in erasing Palestinian life from the map. The report looks at the complex environment of Israeli control and the entire user experience of Google Maps which ignores the reality of occupation: the illegal settlements in the West Bank including East Jerusalem, where the Israeli settler population is approximately 600,000 in 143 locations, deliberately changes the demographic character of the territory. For Google to comply with international law and human rights standards, the service should clearly mark the distinct Palestinian Areas A – administered by the Palestinian Authority, and B – administered by both Israel and the Palestinian Authority; and the Israel-administered Area C – which contains Palestinians, the illegal Israeli settlements, as well as 100 outposts unrecognised by the Israeli government. Google’s mission statement is to “organise the world’s information” and make it “universally useful”, but the report shows how Google Maps progresses the interests of the Israeli government, and mostly serves Israeli citizens. It also shows the way route planning can put the lives of Palestinians at risk. This contradicts Google’s responsibilities under international human rights frameworks. If Google’s route-planning apps identified illegal Israeli settlements, this would help Palestinians travel safely in their own country and would enable the rest of the world to see what’s really going on. Maps have an important role in developing national consciousness as do the landmarks on them. The Wall inside the West Bank separating Palestinians from their land was intended to make Israel’s seizing of territory in 1967 irreversible. The roads – which Palestinians are not allowed to travel on and are not on the map – must make navigating by GPS almost impossible for Palestinians. Unaware of roadblocks, checkpoints etc, a wrong turn may end up in arrest and car confiscation. “The failure of Google Maps to depict Palestinian villages on its maps suggests that their practices are politically influenced and biased in favour of Israel’s systematic violation of the human rights of Palestinians,” the report argues. Many Palestinian towns and villages have been misrepresented or omitted and are blurred on the map, particularly the 46 unrecognised Palestinian Bedouin villages, dating back to the seventh century, which are under constant threat of demolition by Israeli expansion and “barred by Israel’s laws from building any permanent structure, be it a water well, an animal pen, a storage shed or a family home”. The discrepancy of the visibility and erasure of Palestinian villages suggests that the ultimate aim to is “dispossess and expropriate Palestinian land”. Being “unrecognised” also means that Israel refuses to connect the villages to basic services like electricity, running water and sewage disposal – while the Jewish National Fund (JNF) seeks to develop reservoirs, pine forests and water conservation programs in the Negev desert at the expense of more than 150,000 indigenous Arabs. The picture gets worse. According to Ben Lorber, a journalist and activist who’s worked extensively in the US and Middle East, “Israel hides its apartheid behind an environmentalist mirage, and distracts public attention not only from its brutal oppression of the Palestinian people, but from its large-scale degradation of the earth upon which these tragedies unfold”. He’s written that the JNF, established in 1901 when the first Zionist Jewish immigrants settled in Palestine, was determined to “make the desert bloom”. The “Greater Israel” project supports the Jewish settlement movement; aims to annex the West Bank and the Gaza Strip for Israel; intends to weaken, fracture and Balkanise the Middle East. So what would a two-state solution map look like? Israel, the US and Britain don’t seem to want that. Perhaps when Balfour penned the 1917 declaration to partition Palestine he prepared a “divide and conquer” path. Israeli Prime Minister Netanyahu recently commented that everyone defines the term “state” differently. His definition requires that not one of the illegal Jewish settlements in the West Bank be removed and that a future Palestinian state be demilitarised and under complete Israeli security control. Not a sovereign state. Hamas has made military resistance compromises to secure all of historic Palestine, but it’s hard to imagine that happening. I mean, Israel has just passed a law to remove Arabic as an official language. A two-state solution might have worked in 1948 if Palestinians had been given Jordan as their “state”. In reality, Jordan’s army and bureaucracy is now Palestinian. And Israel has spread, as the founding fathers of Zionism, Herzl (1904) and Fischmann (1947), envisaged – from the River of Egypt up to the Euphrates – including parts of Syria and Lebanon. On Google Maps there’s a dotted line between the northern half of Jordan and Israel, and the Golan Heights area bordering Syria indicating a not-yet decided boundary. Following a massive oil find in Syria’s Golan Heights, Netanyahu plans to increase Israeli settler numbers there to 100,000. The “Greater Israel” project – extending from the Nile Valley to the Euphrates – is not exclusively a Zionist expansion plan; it’s a vital part of US foreign policy, supported by NATO and Saudi Arabia. It supports the Jewish settlement movement. It aims to annex both the West Bank and the Gaza Strip for Israel. It intends to weaken, fracture and Balkanise the Middle East. The war on Iraq and Syria is part of the process. Trump’s decision to recognise Jerusalem as Israel’s capital and move the US embassy there on the 70th anniversary of Israel’s founding was meant to trigger unrest. It’s 100 years since World War I ended, but for Palestinians – whose story of annihilation can be found in maps: the stealing of land, destroying of homes, taking and poisoning of water supplies; men, women and children who are still being arrested, shot at, and bombed in acts of genocide; who are still refugees waiting in dusty, filthy camps – World War I has not ended. Those warring government and military officials – and investors – have not finished. As for respectful co-existence, I have no doubt this can be found among Arabs and Jews in Israel and its occupied territories. There are many who want nothing more than peace and equal rights, and friendly and harmonious relationships with their neighbours in an equally shared homeland. A single state encompassing Israel and Palestine doesn’t seem possible. It seems that one group’s right to liberation has come at the cost of another’s. But if fear and power weren’t issues, imagine a map where a mix of mostly resettled European and American Israelis with the indigenous natives of the Middle East are united as survivors. What a wonderful place that would be.